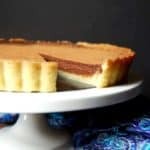 A decadent and delicious Vegan Salted Chocolate Hazelnut Tart with a three-ingredient shortbread crust and a smooth, silky filling. Cut the butter into 1-cm cubes and place in the food processor along with the flour, sugar and salt. Pulse a few times, for a few seconds each time, until the dough forms clumps. Take an eight-inch tart pan with a removable bottom. Empty all of the filling into the the tart pan and then, working from the center, press the dough evenly around the bottom and the sides of the tart pan. When you have a fairly even layer, use a spoon or spatula to smooth it out. Pierce the bottom of the tart shell several times with the tines of a fork. This will keep it from puffing up when you bake. Cover the tart pan with cling wrap and freeze it for 15 minutes. Remove from the freezer and bake in a preheated 425 degree oven for 18 minutes. Meanwhile, make the filling. Drain the hazelnuts from the soaking water, then place it in a high-powered blender with 1 1/2 cups of water. Blend until very smooth. Strain the hazelnut paste through a medium sieve. I really only do this to get any big bits of skin out. The strained paste will be quite thick, like the consistency of pancake batter. Heat the hazelnut paste in a small saucepan until it starts to bubble, which it will quite fast. Don't leave it unsupervised. Once the hazelnut paste has heated, stir in the chocolate chips, maple syrup, vanilla and salt. Turn off the heat and mix until the filling is very smooth. Pour the filling into the tart shell and after about an hour carefully transfer to the refrigerator where it should remain for at least six hours until it's completely chilled and the filling is set. Dust with some cocoa powder, if you wish. Remove the tart from the pan and slice.